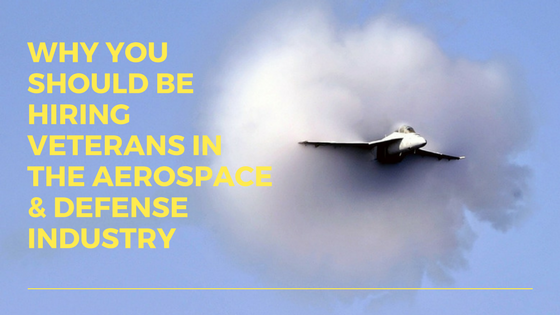 According to Military.com, the Aerospace and Defense industry is “huge and complex,” serving both military and commercial markets. From companies looking to send humans to Mars to those building military aircraft, the opportunities to employ veterans and leverage their state-of-the-art training abound. There are two main issues currently facing this industry for which hiring veterans are an excellent solution. The United States Department of Labor, Employment Training Administration points to the impending retirement of many mature workers, who possess experience and intellectual capital and a loss of technical talent. To combat these impediments, the DOL suggests employers protect the skills base by relying on youthful and diverse workers, found in non-traditional labor pools. Military candidates can perform a wide range of functions in this industry. Here are a few examples of positions in which we’ve seen veterans excel. Veterans have experience juggling the demands of complex programs and projects. Throughout their military career, they have balanced human capital, critical resources, and time constraints to meet organizational goals. Their leadership skills allow them to form and motivate diverse teams to insure the project is done on time and above standard. Veterans have an easy transition from the military to programs supporting the military. They are subject matter experts and proven transformational leaders. Military candidates are well trained and schooled in the technical aspects necessary to succeed as a sales, product, or developmental engineer. Veterans come with advanced degrees and the hands-on experience necessary to contribute to the bottom line. Today's military professionals receive practical application and schooling in six sigma and lean manufacturing principles, and have a solid foundation of engineering skills. This background, combined with leadership skills and unlimited potential, gives a company great flexibility in using our Engineers in a variety of capacities. Understanding the structure of the Department of Defense allows veterans to use their contacts and networks in order to find key personnel and opportunities necessary to generate new business. That ability, combined with their determination and knowledge, ensures success in securing those necessary contracts. Most military candidates are adept in, and fully understand, the RFP and Bid Process. Military technicians represent some of the best electrical, mechanical, and electronic talent anywhere. Technically trained with real world experience, veterans frequently work on the same equipment they worked on in the military. With a greatly reduced learning curve and solid fundamentals, our technicians are able to work on the most complex equipment. Furthermore, their excellent communication skills, professional presentation, and maturity guarantee success onsite at a client's location. As you can see, veterans are the answer to an aging workforce short on the technical talent it needs to innovate. In our nearly 30 years, Orion Talent has helped more than 200 aerospace companies hire veterans. We invite employers to connect with us and learn more about how we can help fill your team with fresh, highly skilled talent you need.